Volunteers who have helped restore a pet cemetery next to Hornfair Park have been given a small grant from Greenwich Council to help them erect a noticeboard and seating area in the rediscovered space. The Friends of Charlton Pet Cemetery are being given £469 for “a notice board to display information about activities and the history of the cemetery and to create a seating area with a stone seat within an arch surrounded by trellis”. Few people knew about the existence of the cemetery until the group was set up in 2012 with a mission to restore the space as a place to visit. The cemetery predates the opening of Hornfair Park, having formed formed part of kennels on Shooters Hill Road bought by the Blue Cross charity after World War I. But after World War II the cemetery was flattened, with the headstones set into the ground. It was largely forgotten about for many years until the Friends group got to work. With donations from Greenwich Council, local businesses and grants, it has cleaned up the space and put in new flower beds and seating. A memorial wall, where people can commemorate cherished pets, has also been installed. If you want to find out more about the cemetery, you can access it from Shooters Hill Road, close to the footbridge at the Fox under the Hill pub. There’s also more information on the e-shootershill website. The grant comes from Greenwich Council’s Ward Budgets scheme, after being endorsed by Kidbrooke with Hornfair councillors Norman Adams, Christine Grice and David Stanley. Each ward has access to £30,000 for community projects and other initiatives. 15 different grants have been given out since December 2015, from money to establish a junior Parkrun in Eltham to electric bikes for fire officers in Plumstead and Abbey Wood. Details of how the scheme will work in Charlton ward have yet to be announced by councillors Allan MacCarthy, Gary Parker and Miranda Williams, who are responsible for selecting bids and putting them forward to council leader Denise Hyland for approval. 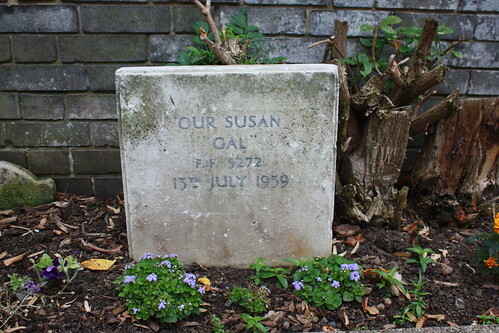 Photo of Charlton Pet Cemetery © e-shootershill. Next Article Ward budgets come to Charlton: What would you fund with £30,000? Give ex-Councillor Jim Gillman a bit of credit here. Jim has been doing what he can to raise awareness of this site for years and years. What an excellent project. I’m really glad the council has seen fit to support it in a small way. Thanks to all those involved.